Ian Hogg, in his book German Pistols and Revolvers: 1871-1945, states that Carl Walther and his son Fritz first marketed their Selbstlade Pistole in 1906, which is a near impossibility given that the 6.35mm Browning pistol cartridge and the first gun designed to fire it, the 1906 FN Browning, did not appear on the market until July of 1906. 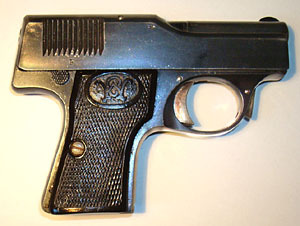 Other sources (Boothroyd, Kersten, Marschall, and Smith) cite 1908 as the probable date for the introduction of the first Walther self-loading pistol. An early advertising brochure for the gun refers to it as the Model 1909, and James B. Stewart says that the original instruction manual for the gun referred to it as the Model 1910. German patent number 235944 for an ”automatic firearm with a fixed barrel” was applied for on 8 August 1909 in the name of Carl Walther, and was granted on 22 June 1911. The gun first appeared in the ALFA catalogue in 1911. It is unlikely that production began before the German patent application date in August 1909. The Model 1 was originally marketed as the “Deutche Selbstlade Pistole Walther, Modell 1910, Kaliber 6,35.” In 1914, when the Walther Model 2 appeared, the original pistol was retroactively named the Model 1. The fundamental design of the Walther Model 1 appears to be similar to the 1900 Steyr-Mannlicher, with a fixed barrel and an open -top slide with sides that extend forward to enclose a recoil spring located beneath the barrel. The gun is striker-fired and has a backstop for the striker spring that is virtually identical with that on the 1906 FN Browning. 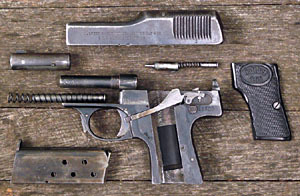 Unusual features of the gun include a nearly full-length barrel sleeve, a piston-shaped sear fitted into a cylinder in the rear of the frame, and a cross-bolt safety that locks the sear. The transfer bar runs in a groove on the left side of the gun and beneath the left grip. The gun has a top-mounted extractor and the firing pin serves as the ejector. The magazine release is of the early type which first appeared on the 1899 FN Browning, wherein the latch is squeezed toward the front of the gun to release the magazine. There is no magazine safety. 1st Variant: The original design featured a separate disconnector with a circular lobe on the bottom which fitted into a circular cut in the transfer bar. The transfer bar had a small flat spring fitted to it which tensioned the disconnector. The piston-shaped sear was held in place by a flat plate which was dovetailed into the frame; this plate had a U- shaped cut in it which allowed the top of the sear to protrude through the frame. A thorn-shaped sear lever pivoted on a pin staked to the frame to lower the sear when the trigger was pressed. The slide featured 17 fine (or sometimes 12, 13 or 15 coarse) triangular-cut slide serrations on both sides. The left side of the slide featured the following inscription in serif characters on two lines: SELBSTLADE-PISTOLE CAL 635 / PATENT Or: WALTHER’S SELBSTLADE-PISTOLE CAL 635 / D.R.G.M. IN-&AUSLANDPATENT ANG, where the second line indicates that German and foreign patents had been applied for. Or: WALTHER’S SELBSTLADE-PISTOLE CAL 635 / D.R.P. & AUSLANDPATENTE, where the second line indicates that a German patent had been granted. Minor variations in the slide legends will be encountered. The crown over N nitro proof mark appears on the right side of the slide in front of the chamber. (Very early guns proofed prior to 1 September 1911 will have the crown over U proof mark.) According to Gangarosa this variant runs from serial number 1 to approximately 8000. On the earliest guns both grips had an oval cartouche at the top with the words “Caliber 6,35” inset. At some point the left grip sometimes featured an entwined “CW” monogram inset in the oval. The second variant featured 12 or 13 coarse triangular-cut slide serrations on both sides. The earliest examples of 2nd Variant guns retain the early lockwork, but it was soon simplified. The separate disconnector was eliminated and became a lobe on the upper side of the transfer bar. The plate holding the sear in place was eliminated and the piston-shaped sear itself was redesigned so that the piston portion sits flush with the top of the frame and is held in place by an L-shaped sear lever. The left-side slide legend is in serif characters on two lines: WALTHER’S SELBSTLADE-PISTOLE CAL 635 / D.R.P. & AUSLANDPATENTE. The second line indicates that a German patent had been granted. I have also seen pistols in this serial number range with a simpler two line inscription: SELBSTLADE-PISTOLE.CAL 635. / PATENT. Most, but probably not all, of these guns had the “CW” monogram on the left grip, and some had it on the right grip as well. According to Gangarosa this variant runs from approximately serial number 8000 to 15000. Since the patent was not awarded until 22 June 1911, we would presume that this variant appeared after that time. 3rd Variant : The third variant is distinguished by the introduction of an extra button on the right rear of the frame, which was used in the take-down--it had to be pressed in order to lift the slide up to remove it from the frame. This button remained on all subsequent variants. The third variant also featured 12 or 13 coarse triangular-cut slide serrations on both sides. The earliest examples retained the slide legend of the second variant on two lines, SELBSTLADE-PISTOLE.CAL 635. / PATENT. but at some point the legend was changed to a single line of sans-serif characters as follows: SELBSTLADE-PISTOLE.CAL 6,35. WALTHER’S-PATENT, and a new banner was added beneath the legend, which had the word Walther in it. The banner was curved slightly, but not as much as the modern Walther banner, so it is known as the “flat” banner, even though it isn’t flat. According to Gangarosa this variant runs from approximately serial number 15000 to 24300, and was produced in 1913-1914. 4th Variant: The fourth variant featured 12 coarse triangular-cut slide serrations on both sides. The slide inscription was in serif characters on two lines as follows: SELBSTLADE-PISTOLE.CAL 635. / PATENT. The Walther banner was omitted. According to Gangarosa this variant runs from approximately serial number 24300 to 25500, and was sold exclusively to Austria-Hungary during the war. A few very rare guns were made with 7-inch barrels. 5th Variant: The fifth variant continued to have 12 coarse triangular-cut slide serrations on both sides. 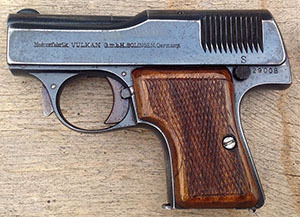 The slide legend was on a single line like that of the third variant, SELBSTLADE-PISTOLE CAL 6,35. 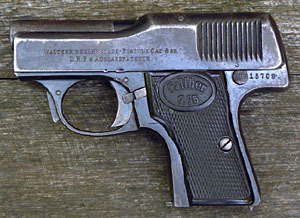 WALTHER’S-PATENT, but the Walther banner beneath it was the modern fully-curved version. According to Gangarosa this variant runs from approximately serial number 25000 to just over 30000. It was made until 1915. Messerfabirk Vulkan G.m.b.H (The Vulkan Knife Factory) is listed in Die Werkzeugmaschine, Volume 8 (April 1904) as having previously been named Vereinigte Messerfabriken G.m.b.H (United Knife Factory). Very little is known about these pistols. The numbers on these guns appear to be in the standard Walther series. With the safety off, depress the catch on the front of the trigger guard and draw the slide all the way to the rear until it locks open. Unscrew the barrel sleeve and remove it from the gun. On early models, pull back on the slide to disengage the slide lock, and allow the slide to ease forward while lifting up on its rear. On later models, pull back on the slide to disengage the slide lock, and allow the slide to ease forward while depressing the right-side take-down button and lifting up on the rear of the slide. When the slide lifts up off its rail, ease it off the front of the gun. Note: On second variant and later guns, once the slide is removed, the lever which operates the sear can easily come off its pivot which will allow the sear and sear spring to launch from the rear of the frame. Take care not to lose these small parts. * Please write to me if you can offer additional information on the Walther Model 1. Photographs of other variants are also needed. Arms of the World: 1911. The ALFA Catalogue of Arms and the Outdoors. Follett, Chicago: 1972. German Pistols & Revolvers: 1871-1945, by Ian V. Hogg. Galahad Books, New York: 1971. “Sorting Out Walther’s 25s,” by James B. Stewart. Guns Illustrated, 1973. Walther, A German Legend, by Manfred Kersten. Safari Press, Long Beach, California: 2001. The Walther Handgun Story, by Gene Gangarosa, Jr. Stoeger Publishing, Wayne, NJ: 1999. Walther Pistols, by W.H.B. Smith. Stackpole, Harrisburg, Pennsylvania: 1946. Walther Pistols: Models 1 Through P99, by Dieter H. Marschall. Ucross Books, Los Alamos, NM: 2000. Copyright 2010 by Ed Buffaloe. All rights reserved. Click on most small photos to open a larger version in a new window & browse for additional photographs.